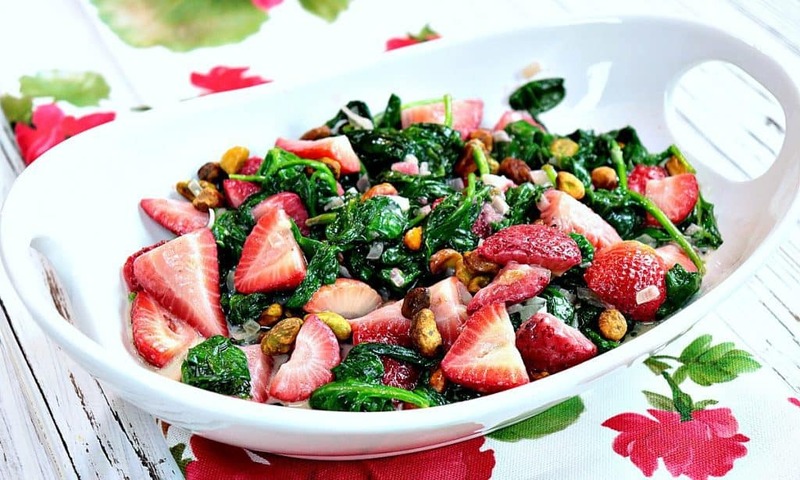 Once you taste this Healthy Sautéed Creamed Spinach & Strawberry side dish you’ll be smitten with its delicious flavor and colorful appearance! This healthy dish of Sautéed Creamed Spinach & Strawberry with Pistachios came about one night when I was contemplating what to serve alongside some fish I was cooking for dinner. Since I had strawberries in the fridge that I needed to use before they spoiled, I tossed some into the sautéed creamed spinach I was preparing. The completed dish tasted amazing, and turned out to be a feast for the eyes as well as the taste buds! **Please Note – The printable recipe card with detailed instructions and complete ingredient measurements for making Sautéed Creamed Spinach & Strawberries is available near the end of this post. What are some of the health benefits of sautéed spinach? When you eat spinach which has been heated you will absorb higher levels of vitamins E and A, fiber, zinc, calcium, iron, and protein. What are some of the health benefits of strawberries? Strawberries are abundant in vitamins C and B9 which promotes normal tissue growth and cell function. Strawberries are also high in manganese and potassium which helps to regulate blood pressure. What about pistachios? Are there health benefits to pistachios as well? Pistachios contain more antioxidants than most seeds and nuts. Only pecans and walnuts contain more. Among other nuts, pistachios contain the highest content of lutein and zeaxanthin, both of which are very important antioxidants for eye health. Pistachios have a higher ratio than any other nut of amino acids, which are the essential building blocks of protein. Below is the printable recipe card for today’s Healthy Sautéed Creamed Spinach & Strawberry with Pistachios side dish. If you’ve enjoyed this recipe, I’d appreciate if you’d take a moment to give this recipe some feedback by way of stars near the comment section at the end of this post. Thank you. 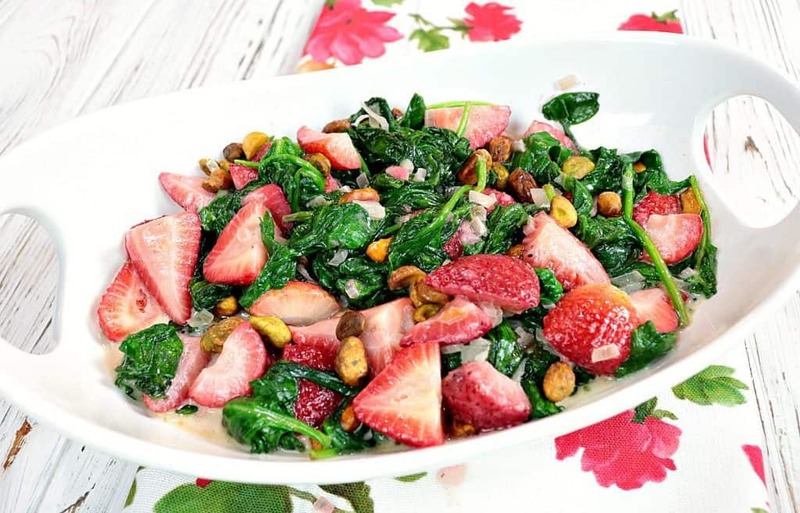 Once you taste this recipe for Healthy Sautéed Creamed Spinach & Strawberry you'll be smitten with the warm and delicious flavors of a dish which is typically served as a salad. In a large skillet heat the oil and butter over medium/low heat. Add in shallot to the pan and cook, stirring for 1 - 2 minutes. Add the spinach to the pan, stirring well. Allow the spinach to cook, stirring occasionally until it's almost completely wilted and has shrunk considerably in volume. **Note - this will happen quickly. Add the salt, pepper, and nutmeg to the spinach. Stir well. Add the cream to the spinach and reduce the heat to low. Stir in the strawberries and cook on low, stirring occasionally until the strawberries are heated through and warm but not mushy. Remove from heat. 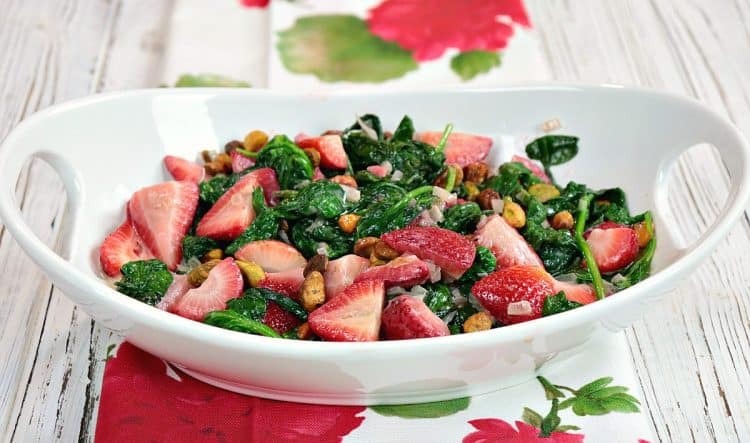 Spoon the sauteed spinach and strawberries into a serving bowl and garnish with shelled pistachios. large skillet, paring knife, chef's knife, cutting board, measuring spoons, measuring cups, microplane (for grating nutmeg). 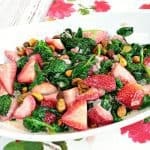 I sincerely hope you’ve enjoyed today’s recipe for Healthy Sautéed Creamed Spinach & Strawberry with Pistachios as much as I’ve enjoyed bringing it to you! This is such a perfect dish during strawberry season! Great for a weeknight dinner or barbecue! Thank you. Yes! It makes a great side dish for just about everything! I have strawberries growing out my ears and am always looking for delicious ways to use them. This is exactly what I’ve been looking for! You’re so lucky to be growing your own strawberries. I’ve only tried it once but the birds kept feasting before I could! LOL!! Enjoy the recipe! Such a fantastic combo of ingredients and I love the pops of color! Totally craving this right now! I just love, love this recipe!! I’m so glad. This makes me happy!! Thanks.